Historically, women have been more avid users of social media than men – a finding consistent across several Pew Research Center surveys. In fact, in November 2010, the gender gap was as large as 15 percentage points. More recent data, however, show that these differences are no longer statistically significant. A new Pew Research Center analysis finds that a similar share of men and women say they used social networking sites this year, consistent with what we found in 2014. Some 73% of online men use social media, which is on par with the 80% of online women who say they do so. Although the overall percentage of men and women who report using social media is now comparable, there are still some gender differences on specific platforms. 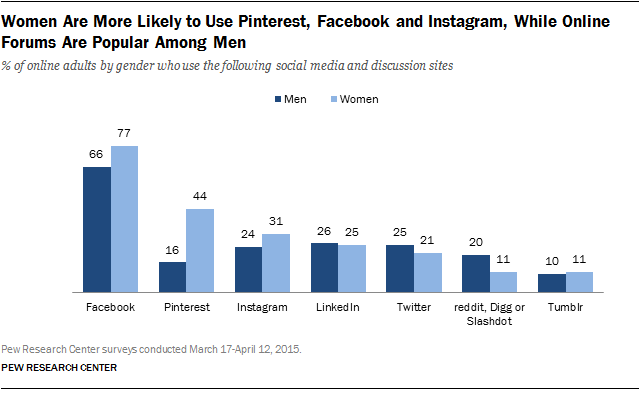 Pinterest, Facebook and Instagram have a larger female user base, while online discussion forums like Reddit, Digg or Slashdot attract a greater share of male users. Gender differences on Twitter, Tumblr and LinkedIn are not significant. Online women are also more likely than online men to use Facebook and Instagram. Some 77% of online women are Facebook users, compared with two-thirds of online men. Instagram use follows a similar pattern, with online women being more inclined to use the picture-sharing site than men (31% vs. 24%). On the other hand, online discussion forums are especially popular among men. One-in-five male internet users say they read or comment on sites such as Reddit, Digg or Slashdot, compared with only 11% of online women. A Pew Research survey from 2013 that only asked internet users about their Reddit use shows a similar division by gender. While most of these gender differences tend to be consistent across Pew Research Center surveys, the gender gap for LinkedIn has narrowed over time. Today, a roughly equal proportion of internet-using men (26%) and women (25%) use the professional networking site. The share of women who use LinkedIn has steadily increased since 2010, when only 12% of women used the platform.